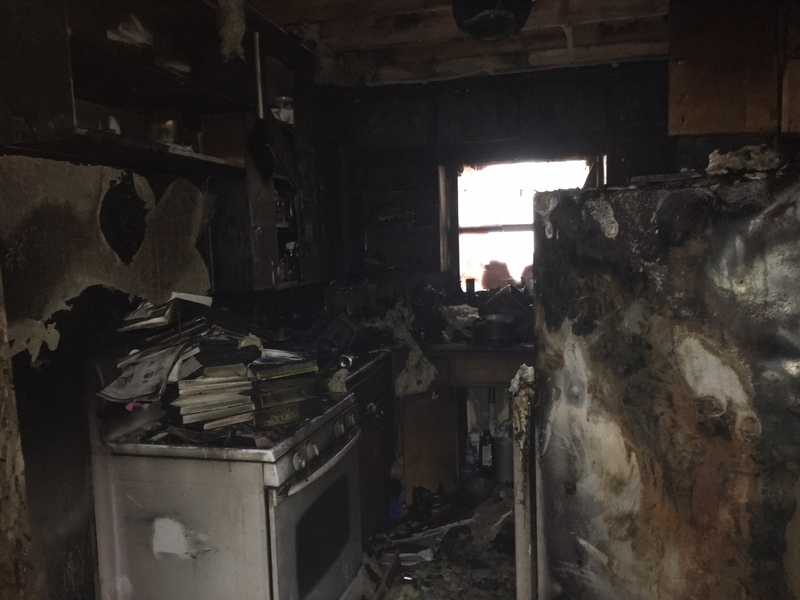 The kitchen is one of many places in the Hubbard House that was destroyed by yesterday’s fire. Last night, while you and I slept, TWT co-author Betsy Hubbard and her family were awakened by the sound of their smoke alarm. A fire started in their garage and tore through their house. Betsy, her husband, and their children escaped without any injuries. However, the fire destroyed half of their home. The parts of their home that weren’t consumed by the flames suffered extensive smoke damage. As a result, the Hubbards are staying in a hotel since their home is uninhabitable. They will need to replace their kitchen, all of their furniture, clothing, and the other necessities of daily life. I have known Betsy for several years. She was part of the Slice of Life Story Challenge community (and served as the Welcome Wagon coordinator) long before she became a co-author of this blog in 2013. Betsy is one of those salt of the earth people who works tirelessly to make the world a better place for her students. She’s passionate about the teaching of writing, as evidenced by her presentations at state and national conferences, as well as the hundreds of posts she’s written here at Two Writing Teachers and on her personal blogs. Betsy is more than just a trusted colleague; she’s a friend. Therefore, I started a GoFundMe campaign to help the Hubbard Family with their immediate expenses. While the Hubbards are working with the Red Cross and their insurance company, you and I both know there will be lots of out-of-pocket expenses. If you know Betsy personally, have heard her present at a conference, or have been positively impacted by one of her blog posts here at TWT, please consider contributing to the Hubbard Family Fire GoFundMe Campaign. No donation is too small. You may donate publicly or anonymously. The choice is yours. No matter how much or how you choose to give, your contribution is needed and will be appreciated. While I coordinated this for the Hubbards, I’ve set up the campaign so the Hubbards have access to all of the contributions immediately. CLICK HERE TO DONATE NOW. As you may know, I’m on maternity leave until mid-January. This post was written hastily with my son in a baby carrier on my chest. Please pardon any typos or grammatical errors. Should you have any questions about this campaign for the Hubbards, you may email me at stacey[at]staceyshubitz[dot]com. Please update us, when it is appropriate. This community is such a great support – in the joys and trials. My heart was so heavy for you this morning (Sun.) when I read it and I am just so relieved you and your family are all ok, thanks to your smoke detector. I pray that you will recover what you need to from your home and that all that you need to move forward will come your way. I know you have made a difference in so many lives and I am positive that all the things you will need to recover will come your way. I shared on FB and am sure that all who know you are praying for you and helping you in the best way they can. What a wonderful teacher, mom, sharer, creative person you are, Betsy. I will pray that all you need to help you through this, will find its way to you. So sorry that this happened and thank goodness their smoke alarms were working! So scary! Glad everyone is safe. I haven’t met Betsy except through her posts, but am grateful for the opportunity to help out. Thanks for letting us know and setting this up. So sorry to hear the news. So glad the family is ok. Thank you for making it possible for us to help them. Such sad news. Thank you for coordinating this, Stacey.